A postable Orange coloured Gift Tin which can be used as a tea caddy too, containing two types of fine tea (4 silken pyramid teabags of each blend). Apple Pie Tea - tastes and smells like apple pie! Very comforting. Chocolate Tea - just you wait until you try it; amazing aroma and flavour! Earl Grey Tea - a favourite! English Breakfast - the classic! ...accompanied by our melt in the mouth all-butter Shortbread. For the Festive season it's 6 generous Shortbread Holly Leaves but rounds, teapots or hearts at other times of year! SHELF LIFE: The shortbread lasts up to 3 weeks wrapped at room temperature but will keep for 5 months in the freezer. Tea lasts for up to 2 years! Price includes standard class UK postage. Who do you know that would enjoy tea and shortbread arriving by post in a charming orange tin? PS The answer is EVERYONE! CHOCOLATE TEA: A blend of black tea from Sri Lanka, Cocoa, Camomile petals & natural flavours. High in antioxidants EARL GREY TEA: A blend of black teas from Sri Lanka with Cornflower Petals, Natural Flavours (organic compliant). 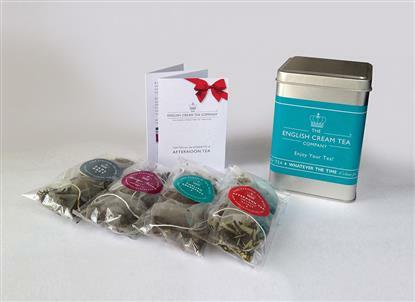 ENGLISH BREAKFAST TEA: A blend of black tea from India, Kenya and China. APPLE PIE TEA: A Blend of Black tea, Apple pieces. Cinnamon, Blackberry leaves, Safflower petals, natural flavours SHORTBREAD: Plain wheat flour, butter (milk), caster sugar, salt.